Root vegetables ( like potatoes, parsnips, sweet potatoes, and carr ots) are the common ones when it comes to roasting. Take a look through your crisper drawer, and you’ll find all sorts of other roasting possibilities from crucifers like broccoli and brussels sprouts to zucchini, onions, bell peppers, and cabbage. Even tomatoes can be roasted. Try any vegetable and see if you like it roasted. Once you’ve cut your vegetables down into bite-sized pieces, toss them good-tasting oil. Use enough to give the vegetables a slick, glossy coating, but not so much that you have puddles in the bottom of your bowl (a tablespoon or two). Not only does the oil help the vegetables cook more evenly and crisp up in the oven, but it also adds a rich flavor that makes roasted vegetables irresistible. Normally a mild olive oil is used when roasting vegetables, but coconut oil, avocado oil, or any other oil would also work. Toss the vegetables with your hands to rub the oil into the vegetables until all are evenly coated. Spread the vegetables out onto a baking sheet. You want to see a bit of space around the veggies( split them between two baking sheets if needed). Crowding will make the vegetables steam instead of roast. The oven should be hot before you put the vegetables into the roast. Around425°F is ideal for roasting most vegetables; this can be adjusted up or down as you prefer. Roast until the vegetables are tender enough to pierce with a fork and you see some charred bits on the edges. 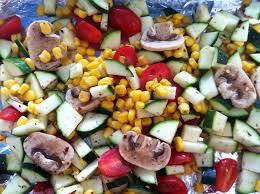 Softer vegetables cook more quickly, while harder vegetables like potatoes will cook more slowly. Smaller pieces will also cook more quickly than larger pieces. If you’re roasting a new-to-you vegetable, start checking after about 15 minutes, and keep roasting until you see charred bits. Those charred bits are what make roasted vegetables so good, so even if the vegetables are already tender and cooked through, keep roasting until you see the vegetables start to turn toasty around the tips and edges. If in doubt, roast an extra five or 10 minutes — it’s unlikely the extra roasting will hurt, and very likely that your vegetable will be even tastier. If you’d like to make a mixed vegetable side dish, you have three options. First, Roast vegetables individually: this is the easiest, you can roast the individual vegetables on separate trays and combine them after roasting. Monitor how quickly each vegetable is cooking and pull each vegetable from the oven when it’s done. Second, Pair vegetable friends: you can pair together vegetable friends (ones that roast at roughly the same rate). For example cauliflower and broccoli, or butternut squash with potatoes. Combine these on the same baking sheet and roast them together. Third, Roast in stages: you can add different vegetables to the baking sheet in stages. Start roasting the hardest, longest cooking vegetables first, and then add softer, quicker-cooking vegetables later on. 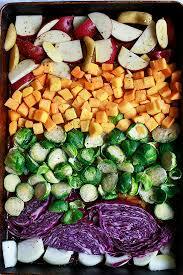 If the baking sheet starts to get full, split the vegetables between two pans, so you don’t crowd them. Aim to have all the vegetables finish roasting around the same time. A little extra roasting time is unlikely to hurt. Cooking times are for roasting vegetables at 425°F. 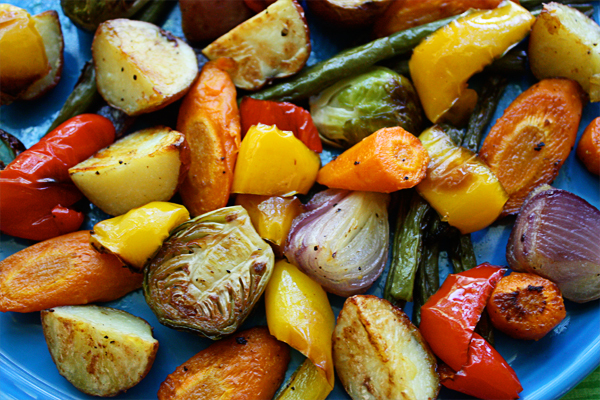 Try the recipe Sheet Pan Roasted Vegetables for a delicious version of roasted vegetables.